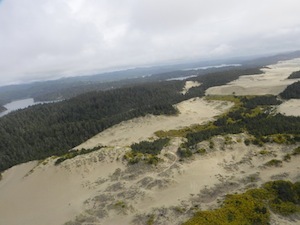 This, the second of my two-part series on an adrenalin junkie’s tour of Southern Oregon, offers up three exciting adventures: sandboarding on towering coastal sand dunes, a thrilling helicopter ride, and yet another terrifying dune buggy ride. Which one of these rides do you think released the most adrenalin into my system in the shortest time? Lon Beale (a.k.a. Dr. Dune) has parlayed his love of surfing down sand dunes into a business and is gaining dozens of converts every day. He practically invented the sport, starting in 1972 when he rode a converted water ski down the hills of the Mohave Desert. And he’s never looked back. Before we leave the storefront office to try sandboarding, Lon gives us the executive summary of the sport and shows us bottles of sand from deserts around the world where he’s plied his trade. I’m not kidding: he shows us sand collected in Gatorade bottles from Mersa Matruh and Siwah in Egypt, and a large shelf holding sand bottles from dozens of other exotic deserts around the world. Lon shows us the sand boards he designed, similar to skateboards in size, but like a wide-hipped hourglass in shape, with two Velcro ankle grips spaced along the board. Next, one of Lon’s young acolytes takes us to a tall dune a few minutes’ drive from Lon’s Sand Master Park Headquarters in Florence to show us the ropes of this extreme sport. Our young coach, a sous chef at a local restaurant during the daytime, shows us how to wax the sand boards for maximum smoothness and to facilitate an exciting ride. “Sandboarding is like a cross between surfing and snowboarding,” he tells us, adding that good riders can reach 55 mph on a dune with the right (well-worn) sand and a steep slope. Hmm … it’s all starting to sound very athletic to me. Even on today’s damp sand he careens down the 20-meter dune, but soon grinds to a halt and wipes out when the board refuses to go any further. 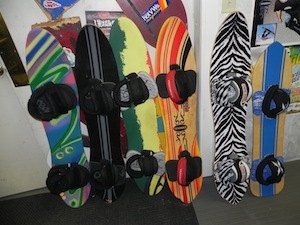 “Keep most of your weight on your back foot, and center your feet on the board. Flex your knees and hips,” he tells us. Pathetically, our small group chickens out, using our ages, our lack of surfing ability, our arthritic hips, and the damp sand as excuses. Clearly this is a skill that will take some practice to master, and we figure we’ll be worn down to nubs from falling on the sand before we become proficient. But don’t let our pitiful attempts stop you from trying this invigorating sport — just make sure you surf the dunes on a mild, dry day when the sand is warm! Whether you want to go Sasquatch hunting or see the rugged and scenic Oregon Coast from up on high, ApexHeli is happy to take you there. After a brief intro about the company and the helicopter, our pilot (with 3,000 hours of experience — I thought it was important to ask him this) pushes the remarkably light chopper out of the hangar. He does a preflight walk around, presumably to ensure that no important bits have dropped off, and then shows us how to squeeze inside the small cockpit. We’re hooked up to the intercom with headphones, and then we’re off. I haven’t been up in a chopper before, and don’t know what to expect, so I’m feeling apprehensive and trying to remember if my life insurance is paid up. I thought it might be bumpy and that we’d be thrown around like a feather in the wind. But I was so wrong! We ascend quickly, gently, and remarkably smoothly. And it’s quiet inside the cockpit. Soon we’re over a wide expanse of white dunes, interspersed with clumps of scraggly scrub, swampland, and weathered, gray, sandblasted trees. It’s a Tolkien landscape, and I expect to see dwarfs and hobbits cavorting around. Miles of green Douglas Firs recede into the distance. Our pilot tells us that some customers once asked if they could look for Sasquatch in the forest, and he was happy to oblige. No sightings, though! We cruise up the coastline, watching the gray sky in the distance and the foamy waves churning into the shore from the gray-green sea. We fly over Florence’s houses and coastal holiday homes and head back over the town at 85 mph. This chopper can move! All too soon we touch down at the same airport we left from (much to my relief). 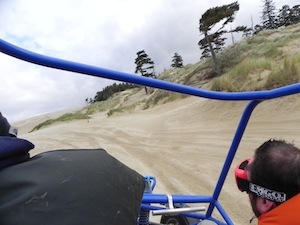 We tour the Oregon Dunes National Recreation area with another dune buggy ride company, Sand Dunes Frontier. This ride was even more terrifying than the previous year. Perhaps the dunes were larger, or our guide/driver pushed the buggy faster, or I’d developed a phobia about dune buggy riding, but this ride rocked my world. I had a white-knuckle grip for the whole ride … except for the first few minutes when we puttered gently along a forest track to come to the top of a dune with miles of sand, trees, and small lakes spreading out in front of us. Lulled into a false sense of security, I’m thinking, “How beautiful.” Our guide pauses the buggy to a gentle idle. With a dramatic sweep of his arm he says, “Welcome to my office” and then kicks the accelerator, blasting us off into the sandy netherworld. Wikipedia says that we can only handle a g-force of 5 before losing consciousness, so we must have been just shy of that figure because I remember every second of the ensuing ride. We went along the sheer sides of sand dunes in wide arcs and even stopped, almost vertically on our side, watching the sand give way beneath our wheels, to accelerate away just when I thought all was lost. I felt great fear on those Oregon dunes — far more than on my wedding day or when I encountered a bear while out on a training run 20 years ago. My blood was drenched in fight-or-flight hormones. Upon our return we talked hysterically and it took hours for us to calm down. That photo of us all smiling in the buggy with thumbs up is all for show.